DEF jugs - DEF jugs are small containers that range from 1 gallon to 2.7 gallons. This option can be extremely time consuming on larger equipment and can also be cost sensitive. Using this option will mean you will have to make several trips from your DEF storage tank to your machine because of the small amount of DEF you can dispense at once. Pros - Easy to handle, light, good for small equipment. Cons - Time consuming on large equipment, expensive. DEF refueling units - This option is probably the most popular. This portable solution will help you minimize downtime in the field or on site. DEF refueling units are a small tank that come complete with a pump, hose and gun. This is a cost-effective option as these tanks range from 25 gallons to 100 gallons, the perfect amount for most machinery. Pros - Good for all equipment sizes, easy to handle and transport, efficient, cost effective, all poly and stainless steel components. Cons - Only available up to 100 gallons. DEF totes - DEF totes are a larger option then refueling units and can also be very awkward to transport. DEF totes work well as a small tank stationed at your refueling location. The tank on a DEF tote ranges from 275 gallons to 330 gallons. Many people that buy totes purchase a DEF refueling unit as well that they use to transport on their pickup truck out to the field. This is mostly because DEF totes can get heavy when they are full. Pros - Can connect to each other, easy to stack, good for larger machinery. Cons - Awkward to transport. DEF bulk refueling stations - This option is a good solution to consider when you are running more than 5 machines that require DEF. These tanks range from 1000 gallons to 10,000 gallons. This option is the largest cost outlay however, is needed when you have several machines. 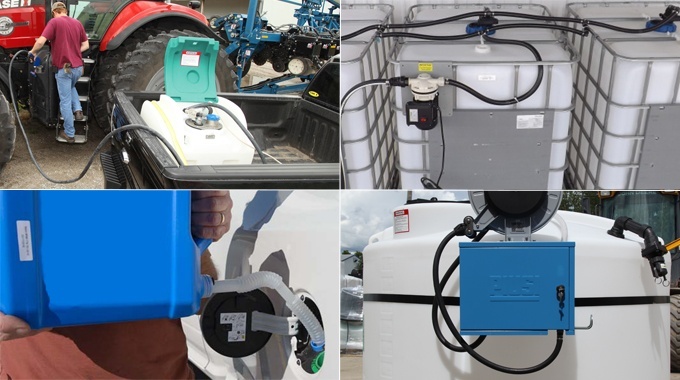 People who choose this option also like to have a portable refueling option on hand that allows them to haul the Diesel exhaust fluid from their station to their machinery on their pick up. Pros - Perfect for large machinery fleets. Cons - Expensive, always stationary. After completing this comparison, it is obvious that each option has its own unique use. An important thing to consider is how many machines you are running with DEF. This will help you decide how much DEF you will need on site. This study also shows that while many people like to have bulk refueling stations and totes, DEF refueling units are also handy because of their portability. Thinking about the amount of time you can save if you can have a DEF dispenser on your pickup truck, is something you must consider.